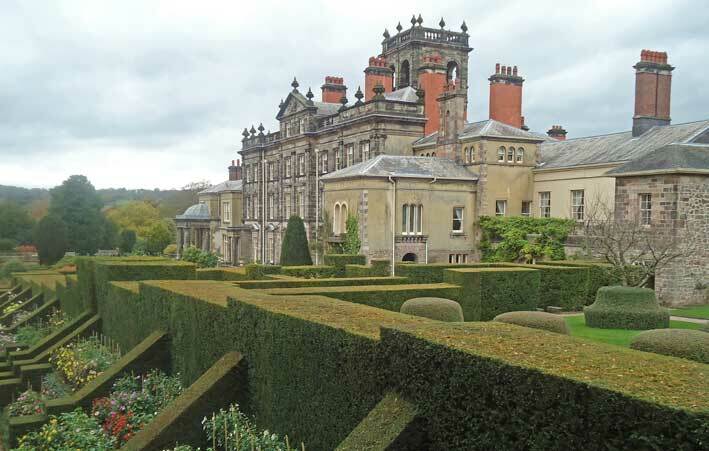 Biddulph Grange is a great example of the Victorian desire for learning. From 1842 trees, shrubs and plants from all around the world were brought to the site and set amongst an assortment of eccentric rockeries and buildings. 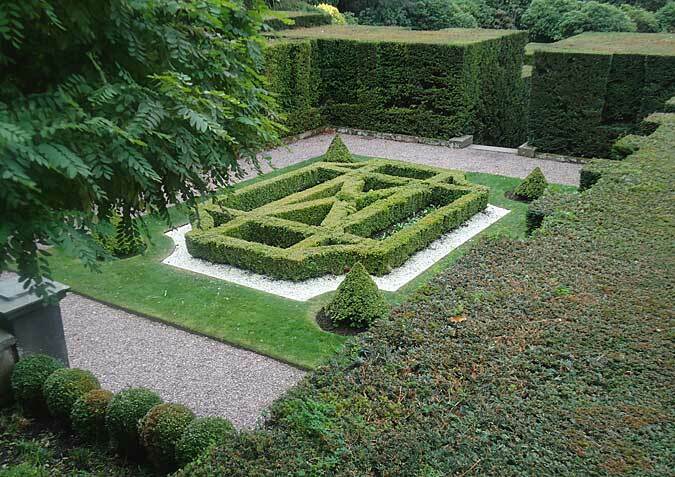 Biddulph was the first garden in the world to use natural planting screens for separating out different rooms or gardens and it is appropriate that yew is the major tree in the more formal hedging nearest the main house. 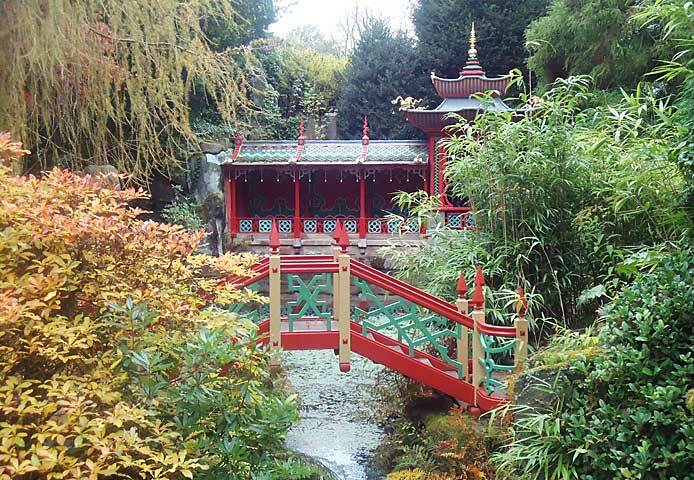 The garden at Biddulph Grange was mainly created by James and Maria Bateman and their friend the marine painter Edward Cooke. James Bateman was fascinated by orchids and established an important collection at his first home Knypersley Hall, also at Biddulph in Staffordshire. In 1838 he married Maria who came from a gardening family and was particularly interested in lilies, fuchsias and camellias. In 1840 the Bateman’s moved to Biddulph taking their collections with them. Edward Cooke paid the first of his many visits to the garden in 1849. 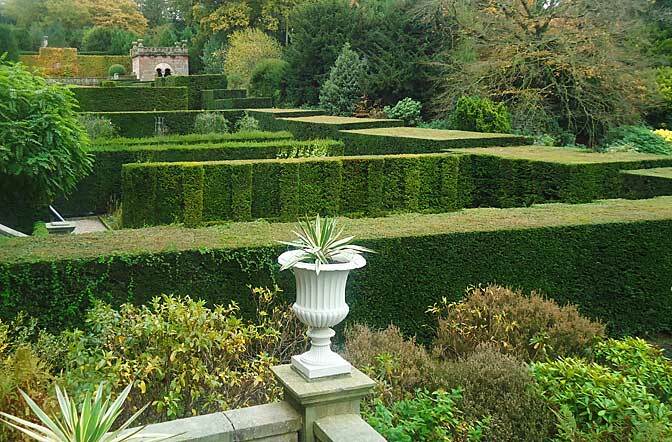 He was the Son-in-law to a nurseryman and was passionate about designing gardens and so the great creation of Biddulph Grange gardens began. The Dahlia walk is instantly recognisable as a world class view. 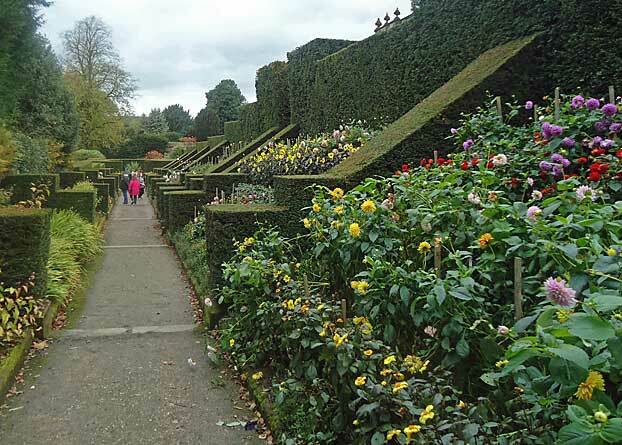 The yew hedges with their flying buttresses separate the beds into sections and each contains a different variety of dahlia.The plants are relatively new having been planted as part of the National Trust’s authentic restoration in 1990. The fact that dahlia’s have a lot of green foliage makes then blend in to the view and their colourful heads which are all “natural” colours add a sense of excitement and uniformity, but that uniformity that you used to get from the brilliant designed uniforms of Napoleons cavalry. 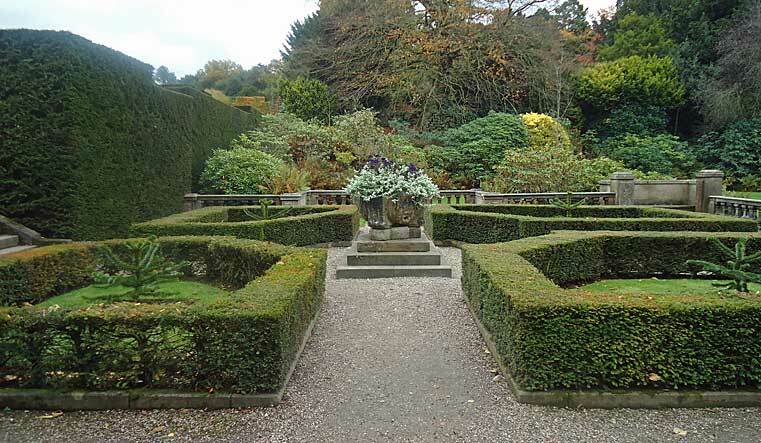 Biddulph has a great number of high yew hedges on the upper terraces nearest to the house. They separate different rooms similar to those at Hidcote but there the similarity ends. In one you will find a lovely box parterre which transports you directly to Italy. A lot of the Victorian gardeners would scour the world for new and exotic plants and at Biddulph this sense of traveling round the worlds is heightened by different sections emulating Egypt and China and other places in Europe. Biddulph has such a sense of journey that they have to give you a map. You take long paths which disappear under tunnels, through trees, up onto ridges with bridges, through tight spaces and suddenly you find yourself in a pagoda complete with bells and a wonderful view of a highly painted bridge. Of course you want to run on instantly and stand on the bridge and look back at where you have just come from but the effort is well worthwhile. 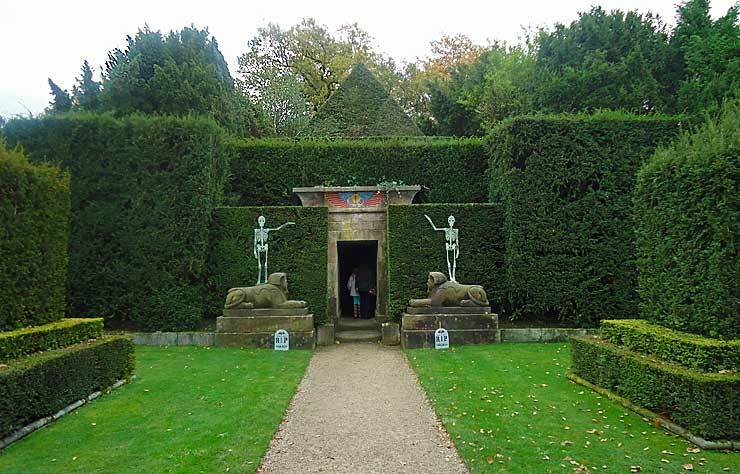 Perhaps the most romantic part of the garden is one called Egypt where yew hedges form the walls of an Egyptian temple. This is a must see on any topiary tour. You can disappear inside a small network of tunnels and then re-appear in another garden altogether. There is much inspiration here for the more modest garden owner to replicate one of the areas that takes their fancy. 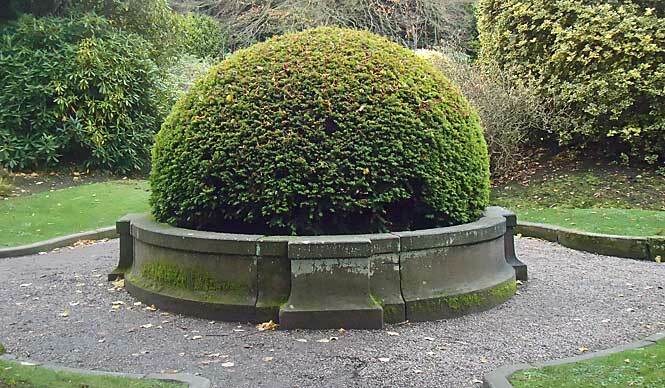 A nice touch at Biddulph amongst all the yew and box are the cotoneaster hats or teacakes or whatever you will. This reminds the topiarist that there are many hardy species which can be shaped and cotoneaster has the added attraction of having red berries in season. Of course female yew trees also have small red berries late on but that’s another story. One small note on a garden that is so vast and attracts so many visitors. The tea room is rather small so do not plan to eat out in style otherwise you may well be disappointed as it gets full in no time at all. If you are heading back south on the M6 then the sat nav can take you through endless suburbs of Stoke on Trent so you may want to plan your journey. 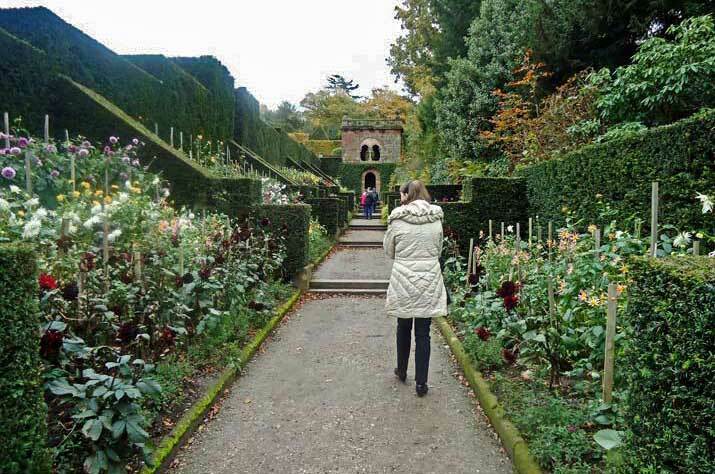 Mind you I would definitely recommend making the journey as Biddulph Grange is like no other garden and particularly attractive to children.